Finally a foolproof, safe and elegant way to open a champagne bottle. This is the only champagne opener that does not require you to remove the foil. Of course, it still works if the foil has been removed, but the important part is that you don't have to. Quickly and easily remove the foil, cork and wire cage all at the same time. Simply place opener over top, loosen the wire cage, twist, pull and viola! The cork comes out with ease out, and without the possibility of injuring someone or something nearby. No more struggling with conventional openers, or causing champagne to spray all over. This simple and effective tool makes the chore of opening champagne bottles quick and simple. The patented design of this chrome-plated opener has no moving parts, so there is nothing that can break over time. This high quality opener will last for years, and comes complete with a limited lifetime warranty. It makes a great gift idea, and is perfect for the holidays, as a wedding or shower gift, or as the perfect anniversary present. The Perfect Pop is the only civilized way to open champagne. Fast. Easy and Safe. Locate the wire loop inside the metal wrapper. Pull the loop out through the foil and away from the neck of the bottle. Please Note: Do not unwind the loop. Leave the foil and wire cage in place. Sharply twist the Perfect Pop down clockwise onto the cork until it grips securely and covers the cork. If the cork starts to turn, stop twisting. While holding the Perfect Pop firmly in one hand, unwind the wire loop and loosen the cage at the bottom with your other hand. Hold your champagne bottle at a 45 degree angle pointing away from you, in a safe direction. Twist the Perfect Pop clockwise. Gently pull upward until the cork "pops" out of the bottle. To remove cork, twist counter-clockwise out of Perfect Pop. Perfect Pop is a fast and simple solution. Quickly and easily open any bottle of champagne. This great gadget will remove the cork, the foil and the cage all at once. Order Yours Today! 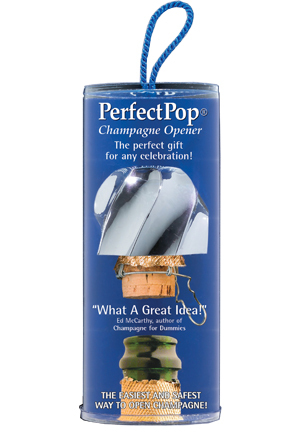 Perfect Pop Champagne Bottle Opener - Easily open champagne without removing the foil or cage. This is the easiest and safest way available. The Perfect Pop is also the perfect gift for any celebration. Order Yours Today.